This is going to be really fun. It'll be like going back in time forty years. We'll be using websites with litterally no CSS. This tutorial is intended to be an introduction to shell scripting. There are several scripting languages out in the wild, and in this tutorial we're going to focus on using Bash (bash). Others you will encounter while programming include the Bourne shell (sh), Z shell (zsh), and the fish shell (fish). It's sort of like the editors we use to write code, some people like vim or emacs and everyone else likes Visual Studio Code. If you are writing a shell script for others to use, you will want to use either bash or sh, as those are the most widely available shell scripting languages 👩‍💻. The Unix shell has been around longer than most of its users have been alive. It has survived so long because it’s a power tool that allows people to do complex things with just a few keystrokes. More importantly, it helps them combine existing programs in new ways and automate repetitive tasks so they aren’t typing the same things over and over again. At the heart of working with the shell is a command called man, for manual. This is a lifesaver. Almost every popular command will be published with their own manual. Running man <command> will display the manual, and give you an idea of how you can use the command. Every command will come with a synopsis. It is worth learning how to decipher them. Let's break down the one for mkdir, a command used to make directories. Do not panic! There are conventions we can lean on to understand this alien text 👽. I've seen it mention that a commands synopsis is vaguely regex based. Writing this tutorial is the first time I've even consider that might be true. What really matters is those strong conventions that you should be able to learn. First let's look at mkdir, this is the name of the command we're looking at using. Then we have [-pv], the square brackets mean that what is inside is optional, i.e. we don't need to include them when using mkdir. What's inside the brackets are two options we can pass to mkdir to change it's behaviour when it runs. The details should be provided for each one further down in the manual. You can pass them together (-pv), or separately -p -v.
We have another option [-m mode], and this one shows that it accepts a value (called mode). Again, it's usage should be documented further down in the manual. We then have directory_name .... Because directory_name it is not prefixed with an option (either --something or -s) it is called a positional argument. It's followed by ... which means this is a variadic positional argument, i.e. you can pass mkdir one or more directories. Utility Argument Syntax, "introduces terminology used [...] for describing the arguments processed by the utilities"
These are a collection of commands that are worth knowing exist. There are lots more, and if you know what you want to do, usually a quick search of Stack Overflow can find you the name of a command you could use. 📝 The descriptions for all these commands come from running man <command>. Yeah I totally ran man man, don't think I've ever done that before. The shell is actually a programming language: it has variables, loops, decision-making, and so on. From The UNIX Programming Environment, Prentice Hall, Inc. It's as simple as VARIABLE=value. There are some other form depending on the shell language, but that one reliably works. That's all there is to get started with variables in shell scripts! These are a little weird. I always have to check the manual for if statements in Bash. There are loads of things we can use for TEST-COMMANDS. See https://www.tldp.org/LDP/Bash-Beginners-Guide/html/sect_07_01.html#tab_07_01 for the basics. Let's have a hello world example that only runs if a file exists at ~/.hello. Again, it's weird. But it does work. Bash supports for, while, and until loops. 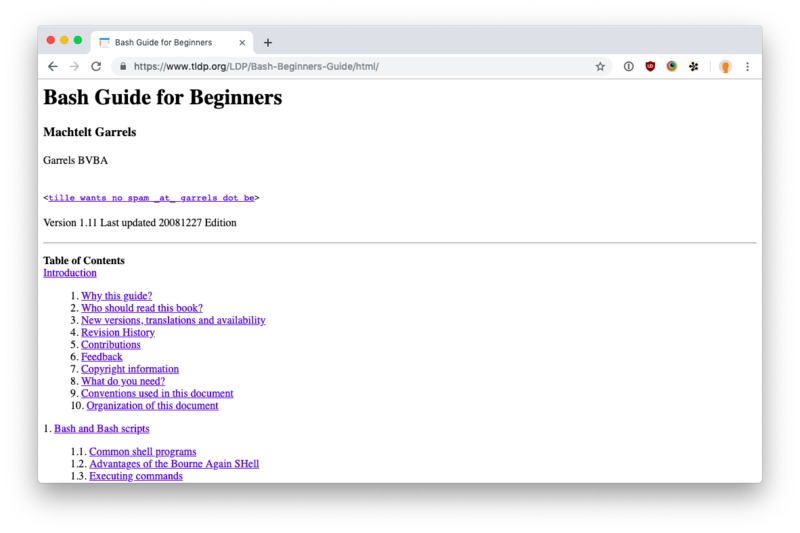 Check out chapter 9 of the Bash Guide for Beginners for the syntax. for loops are great for running commands over a list of something. while is perfect for running until some condition is met, as if you were running an if statement over and over again, looping as long as the condition is executes successfully. until is a while loop except the loop continues until the condition executes successfully. If you want to keep running a command over and over again, here's a handy one line Bash script you can use in the terminal. Functions you may come across, but they are not so common in small scripts. Here's a hello world example wrapped in a function. Okay, a little odd, but it works. What a world we live in. When we come across passing arguments to shell scripts later, you'll likely spot some similarities to how functions access arguments. Let's talk about plumbing! In the Unix sense. This is actually a massive and fascinating area of working on the command line. We're only going to scratch the surface. Shell scripts, like any other program, can read from stdin and write to stdout and stderr. Pipes are a way of chaining the output of one process into the input of another process. This is really powerful, and enables us to compose commands together in ways the original engineers may never even have considered. The syntax involves using the vertical bar character (|). Also known as pipes in Unix terminology. If we want to turn that into an ordered list of deduplicated repositories, we can combine two programs to get the result. We'll use sort to order the list of repositories, and then when everything is ordered, we can use uniq to remove any duplicates. The stdout stream from our call to sort is piped into the stdin stream for our call to uniq. Now, if we want to save the result to a new file, we can use redirection. This involves the angle bracket characters (<, > and also >>). Let's save the result to a file called unique-repositories.txt. This takes the stdout stream from calling uniq and redirects it into our file called unique-repositories.txt. Using a single > means we will either create or overwrite the unique-repositories.txt file. If instead we use >>, that will append the output from uniq to our file. To write an executable shell script (i.e. one you can run on the terminal like ./my-script.sh), it needs to start with a shebang, which tells the terminal how to run your script. Here's a hello world example written in Bash. The shebang is #!/usr/bin/env bash. You may also see #!/bin/bash. You might also have seen #!/usr/bin/env node before. Wikipedia has a great page on shebangs, https://en.wikipedia.org/wiki/Shebang_(Unix). You can pass arguments to a script from the command line, and read their values in your script. Let's say we call our script with ./our-script.sh foo-bar fizz-buzz. We can read these two positional arguments with a magic-ish variable notation. The number we use matches the position of the argument we want to read. Which will print the following to stdout. Let's try to take some of what we've learnt and write a shell script. Write a script in Bash that adds .spec to the name of all .js files in a given directory passed to the script. For example a file called foo-bar.js should become foo-bar.spec.js. We should be able to pass the script a path as an argument, e.g. ./js-spec-rename.sh test/. Bonus question, what would we change about how we use the script to simplify it dramatically? Super bonus activity, use shellcheck to lint your script. Super super bonus activity, try writing some test for your script! Check out https://github.com/sstephenson/bats for a testing framework written in Bash.